I was updating our current Windows 2008 R2 image for MDT with all the latest security updates and ran into an annoying issue. After capturing the image and deploying it to VM (or a physical machine) I kept getting the error “Windows could not parse or process the unattend answer file for pass [specialize]”. I thought this was really odd because MDT created the Unattend.XML file for me. The same process has worked for me for over a year, why all of a sudden did it stop working? I found my answer at this link. I must of accidently installed IE10 when doing my security updates. In the unattend.xml file there is a line for IE9 called . This does not existing in IE10 so it causes the specialize phase of Sysprep to fail. Below is a excerpt from the unattend.xml file that was causing the issue. You just need to comment out the line <IEWelcomeMsg> and you should be all set. 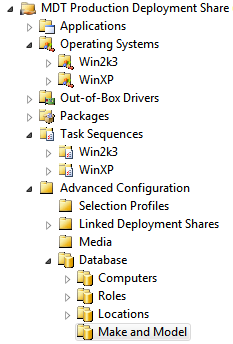 I recently upgraded our MDT 2010 Deployment share to 2012 and ran into an issue with USMT 3. We still have some scenarios where we are deploying Windows XP so USMT 3 is required. Whenever we ran a task sequence that needed the USMT 3 files we would get an error that the files could not be found. I thought this was odd since the USMT 3 CAB file was in the correct location. Or at least it was for 2010. In MDT 2010 you just had to leave the USMT30_x86.CAB file in the DeploymentShare\Tools\X86 folder and MDT took care of the rest. With MDT 2012 you need to create a USMT3 folder in DeploymentShare\Tools\X86 and then unpack the CAB file into this folder. It will not unpack the CAB file for you anymore. Now MDT will be able to find the USMT files and continue. Hopefully this helps out anyone else that has done an upgrade from 2010 to 2012. I was asked by a commenter (here you go Alan!) on expanding on how I use a Make and Model query to automatically assign applications to a specific hardware models. It’s a very easy and powerful feature of MDT and it makes installing those OEM supplied utilities a lot easier. I’m going to assume that you already have your SSM packages created in your MDT Applications. If not refer to my post on them here. The first thing you need to do is configure the MDT Configuration Database. There are many articles on the internet that already cover this (including the MDT Documentation) so I won’t rehash that information. One I found particularly good was this one. After you have configured that database and the rules make sure you update your WinPE boot images. If you don’t they will not be able to take advantage of the make and model queries. Now that your database is configured and you have configured your rules (all explained in the previous link) you can use MDT to dynamically assign applications based on model. In the Deployment Workbench go to Advanced Configuration > Database > Make and Model. Right click Make and Model and choose New. On the first screen you need to define your Make and Model as is represented in WMI. It’s important that the Make and Model fields exactly match the Name (Model) and Vendor (Make) attributes store in the WMI database. For those that don’t know how to find this information you can use the WMIC tool to display it. The below command returns the Make and Model information from WMI. Note that Name = Model and Vendor = Make. After you enter in the Make and Model information click on the Applications tab. Click Add and choose the SSM application that you want to assign to this model. You can assign as many as you want. Each application that you add to this make and model will be automatically assigned when you choose a deployment task sequence. Boot from you WinPE image and choose your deployment task sequence. When you get to the screen to choose your applications the ones you previously added to the Applications tab should already be checked. This is a great way to deploy OEM specific applications in an automated process but you can also do this with any application in MDT.